For my third article in our series on pruning fruit bushes I’m tackling raspberries and blackberries (for other fruit bushes see the links to Part 1 and Part 2 at the end of this article). It’s just great to find plants such as these that can be classed together. Immediately you know what to do with two plants instead of one, even though they might at first appear completely different. Cut down fruited canes as close to the ground as possible. Ideally you should do this as soon as they’ve fruited. They will die off anyway, but removing them sooner rather than later has a couple of advantages. One, they won’t be a drain on the plant’s energy, which will then be concentrated into the new canes, destined to bear next year’s fruit; two, they won’t shade the new canes from sunlight, so the latter will develop better. The taller and stronger the new canes are at the end of the summer, the more fruit you’re likely to pick next year. If you’re worried about which canes to cut down, then look for the empty hulls of last year’s fruit. They’ll be on the branching canes. New canes are smooth and unbranched. Still, it’s not the end of the world if you don’t prune them out then and, as is the way of things, I tend to find myself cutting them down in late winter, when doing other pruning. Raspberries are one of those plants that throw up suckers, so you need to keep an eye open for those and cut them off at ground level. Weedy ones should be got rid of completely but, if you want another raspberry plant, dig out a robust-looking sucker and plant it where you’d prefer it to be. Despite their different habit, blackberries are treated the same way as summer-fruiting raspberries. Fruited canes are cut right back, the current year’s new growth left to fruit next year. I have to admit to allowing my rather rampant blackberry to grow in a hummock. This isn’t recommended in the best gardening circles, and surely makes tidy gardeners blanch, as new canes tend to reach out and root themselves where they touch the ground (which is great if you want more bushes – just dig up and replant). It also entails some careful manoeuvring when it comes to reaching into the bush to remove fruited canes at the base. However, I’ve never got round to putting in any posts and wires. For those who are much tidier than I am, one of the most efficient approaches is to set up posts and wires to the left and the right of the blackberry plant. The idea (called the "alternate bay system") is that you train all the canes grown in one year onto the wires on one side of the plant, (say, to the left), and all the canes the following year on to the wires on the opposite side. This means that all those to the left fruit at the same time and are cut down together, to be replaced with the new canes growing in the year when all those to the right are fruiting. Again, if you’re at all worried about deciding which are the fruited canes, then just look for clusters of empty hulls that remain on the branches. These are generally grown to fruit on canes grown in the current year. (I say, generally, as some people do aim to get two crops, one in early summer from last year’s late growth, but we’re going for the simpler approach.) Just cut all the canes down to ground level in winter, and that includes any new canes that might have poked their heads up towards the end of the previous year. You can, if you like, and especially if you fear a late bout of severe weather, wait until the new growth starts in spring, as the old canes will give some protection to the crown. However, don’t delay cutting down the old canes once the new growth starts, and don’t muddle up last year’s growth with the new season’s. If the new canes come up thick and fast in spring, then it’s a good idea to decongest the plant by taking out the weaker looking shoots, but I find that most of the time you can leave them to get on with things. For Part 1 of this series on How to Winter Prune Gooseberries and Currants, Click Here. For Part 2 of this series on How to Prune Blueberry Bushes, Click Here. "I am confused! I cut the tops off my old fruiting canes in the autumn (down to where the buds ended). No new ones appear to have grown yet and the old ones have buds on them. What should I do? Many thanks." "We have had to clear all of our raspberry and blackberry bushes so that work can be done on the water supply at the allotment site. I have cut the raspberries down to ground level and put them in shallow holes with the roots covered - will they come back? I am replacing the blackberries as they are very old - I have seen advertising for the fruiting in the first year bushes. Are they worth it. " "Hi, T Fray, I'm a little confused too! Fruited canes should be cut down to the base. 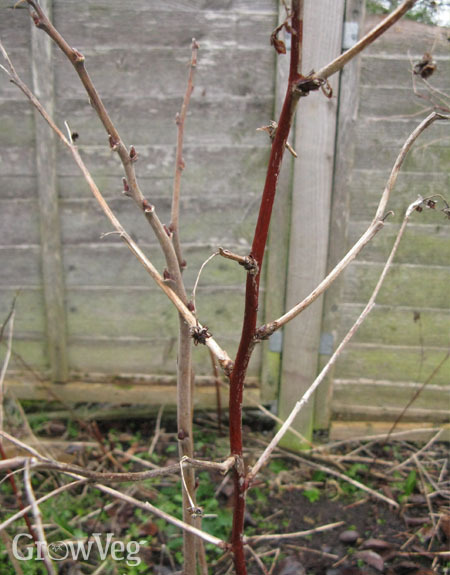 If your canes are autumn-fruiting raspberries, then the new canes will start growing in spring. Does that help? Mary, by all means try replanting the raspberries, put them in good soil with compost and keep well watered and they may well come back. The blackberries which fruit in the first year are very new, so there isn't much information about what people think of them. However, this reference http://www.lane-ag.org/pubs/food%20science/Blackberry%20Research%20in%20Ak%20and%20OK.pdf indicates that their performance may well depend a lot on your climate, seeming to prefer the cooler climate of Oregon, for example, the the heat of Arkansas. If anyone else has tried them, let us know. " "I am as new as they come to gardening and last year planted bluebery, raspberry and blackberry bushes and got zilch from them all. Is there a chance they will grow fruit this year. ? I have just left them in the ground since last summer." "Sorry I forgot to say my rasps are "Autumn Bliss" and I planted them last year. In late autumn I just removed the dead flower heads of last year (only a few rasps appeared) and left the rest of the stalk standing because buds had already formed. If I cut them to the base now nothing new appears to be growing yet. I had heard that some people cut some of their autumn canes to the base and leave some of last years canes on as well so that they get early and late autumn asps. That is why I am so confused. 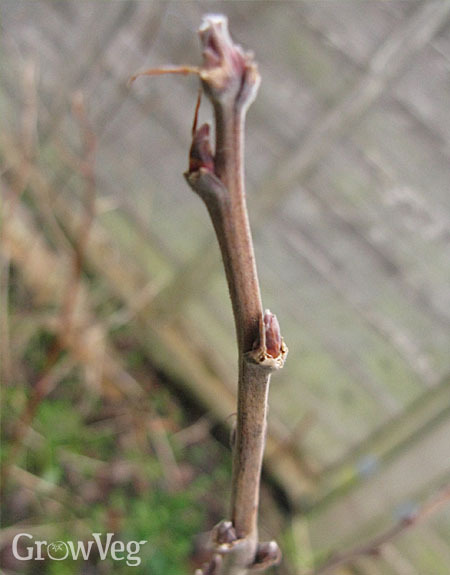 I take it I should cut all autumn canes down to the base now regardless of whether buds are forming?" "Hi, Shona. Give them a chance! They're all very young. If you look at the blueberry pruning post a couple of weeks ago, you'll see that it's best not to let blueberries crop in the first couple of years, or if you really can't resist it, only very lightly. This is so they build up their strength for later years. Blackberries fruit on last year's wood, so you should get some this year. Ditto raspberries. But don't expect a massive crop from either. As I say, they're young and will take time to get into their stride. T Fray: It's hard to cut things down when they're obviously growing. Yes, some people do get two crops from their autumn raspberries (as you say, it's the new canes that grew last year that produce an early crop. The ones that come up in spring fruit in autumn). This isn't the normal way to treat autumn-fruiting raspberries, though. My own suspicion is that if you do this for several years you'll see the yield fall, but perhaps others who have done this might like to comment on that. There's no reason not to experiment, though, so why not leave a couple of canes that you beheaded last year and see what happens? Personally, I'd cut down the rest to the ground, though, in preparation for the new canes emerging. Hope that helps." "We have wild blackberry bushes that did produce some nice berries with little or no pruning through the years. Since they have become overgrown and entangled. Trying to help with pruning, my husband cut them down to about 6 inches with the mower on his tractor. Will they come back? Should I try to transplant the rooted areas and begin pruning correctly in the future if they do come back? " "Do I understand correctly that Boysenberries are a type of Blackberry? And would be pruned the same?" "Carol, I'm sure they'll come back. No reason to transplant unless they're in the wrong place, but pruning them will make them easier to deal with from year to year. Lori, Boysenberries are a blackberry hybrid and should be treated the same way." " Message: I need help in determining if I have an invasive "look a like" weed growing among my blackberries. It grows straight up on thick stalk, the leaves are shaped the same way, but are a lighter shade of green and look shinier. All three of my plants have this growing up the center of their root area. Is this part of my plant, or should I remove it? Thanks"
"Hi, Charles. Difficult to say without a photo, but it sounds as if it's a new blackberry shoot from the roots of your plant. Lighter and shinier could just be younger and perkier. " "Thanks for reply Helen. This is a big stalk growing from middle. It is not a runner just a big stalk. " "I have same look a like weed; not fruit produced at least for a month so pulling these as they are drinking much needed water --- they have 5 leaves and the other fruited stalks have 3....gotta be impostor weed "
"Hi. We moved into a house in December 2010 outside of Rochester, NY, with a large, very mature Raspberry plot and several mature Blueberry plants (the latter are a different story). The previous owners left us directions to cut all the raspberries down in the fall (or very early Spring) but in their rush to leave, they hadn't cut any down that fall. The following summer (2011), the raspberries were bountiful, with berries in the summer and again in the fall. My husband researched and confirmed we should cut them down, so we cut them all down late last Fall and this year, we have nothing yet - as of early August. They grew quickly, but there has maybe been one berry. Last summer, we couldn't pick them fast enough! What are we doing wrong? Is it the hot, dry summer or did we cut too may down? Thank you!" "Susan, I'm assuming that, as your predecessors said to cut them all down, they're autumn fruiting raspberries. I think it's likely that as they produced so bountifully last year (twice! ), they've exhausted themselves and it's just a bad raspberry year for you. Cut them down again as instructed and I'd expect you to do much better next year. " "My blackberry is now about 2 years old. I did like I was advised and trained it to grow 2 different ways..left and right..but no fruit have started to grow yet. Do I need to prune it yet or wait for the first fruit and when will that be? " "we bought 2 blackberry and2 raspberry plants last fall . they were just tiny sticks ,each one got one shoot. now there growing new stalks that are more plant looking one has even started a new plant. how should we take care of them? and will they grow in a shaded spot? which one is in and not nearly as big as the others. thank u wanda"
"The one growing in shade won't be as large as the others because of the lack of light, and fruit won't be so plentiful or sweet. It depends whether you have alternative growing areas, and what sort of of harvest you'd like, as to whether you'll get a harvest that you're happy with. If it's in deep shade all day (rather than just part of the day) then it would be best to move it to a lighter area or I doubt you'll be happy with its performance. As for looking after them, plant them out at the recommended distance, mulch them every spring with well-rotted compost, and prune as above. " "I have a question regarding cutting off new shoots. It is close to fall and my new shoots are getting very tall (8'-10') Should I cut to top off now, wait until winter, or not cut." "I have a row of Autumn bliss raspberries that has been in place for about 3 years. 1 plant fruits well but I get nothing from the others. They are in sun part shade and I have expanded the bed by repalnting runners that have escaped into other areas of the allotment. I fed them with a mulch manure in the autumn and they produce a lot of leaf but no buds. I am starting to get disappointed "
"Dave, are you talking about raspberries or blackberries? Susan, are the raspberries that don't produce all in the shade, and the one that does in the sunshine? That might be one of the problems. Another is that I wonder if you're feeding them too much nitrogen, which encourages leafy growth. Give them a high-potash feed, which will encourage flower and fruit formation. " "Hi Helen, It's actually both my raspberries and blackberries that have grown to 12 feet and are bent over because my containment fence is only 6 ft tall. Should I leave them that long, should I cut them back to 6-7 ft now, or should I wait until they are dormant? " "Thanks for the advice Helen. When do I give the potah feed and is there any chance the ones in the shade will fruit ever. I presume the use of runners and escapee plants to increase stock is OK. I did read somewhere about plants being sterile but not sure what this means. " "Susan, feed potash in the spring. Transplanting runners is a recognised way to increase stock so there shouldn't be any problem with that. You'll just have to wait and see if the ones in the shade fruit - they're never likely to be as plentiful as those in sun - though if they don't fruit after the feed I'd be dubious if you'll ever get fruit. Dave - I'd leave the raspberries till the spring and cut down to a convenient height. As blackberries tend to be rather more spiky and whippy in the wind I think I'd take down the long stems to a convenient height now. No point in getting damaged yourself. " "Sorry im a slow learner and im not sure if its still ok to ask questions as alot of the posts are older....I have some new transplants of both kinds of berries but dont know what kinds i have...so if i understand right i can just cut all of them down to the ground in late winter and i will still get fruit that year? black or rasp? or do i need to leave some...most of my plants did not give fruit as it was their first year but they grew well so i do i leave them untill they give fruit then cut them to the ground? " "I'm am never sure if when new canes start growing, while waiting for last years canes now bearing fruit should be left alone or pruned. Will cutting them back help the production and quality of fruit be better if I do prune new growth. By the time I am ready to pick fruit the new canes are very long and in my way while picking the berries. I live in California and my trailing berries have finished bearing by Mid July at the latest, which still gives any new canes plenty at that time to grow to a acceptable height for next years berries,. I forgot to mention that I do have them on a three wire support. Hope you can help. I've read many articles but none ever mention what to do about this particular situation. ."
"Hi Joann. Leave the canes that are producing fruit alone. Wait until you've harvested all the berries, then prune. If the new canes are in the way, try to separate them out, and tie them so they are out of the way and growing clearly apart from the fruiting canes. The alternate bay system Helen describes above should help with this." "Just planted raspberries and blackcurrants about 2 months ago. Someone cut the grass, thought they were sticks and mowed over them! They still have stumps will they ever grow?" "Hi D Hall. I have to be honest and admit I'm not sure as to whether the canes will grow again or not. If they do show signs of life then they'll hopefully recover as the growing season progresses - but mowing them to ground level does sound like a bit of a shock to them! I hope they re-grow for you - best of luck." "We inherited a straggly raspberry patch with our house a few years ago, and found that with water and fertilizer, we had nice large canes with a good crop of summer raspberries. I learned to cut out the old canes, doing that in the spring the first 2 years. Then last fall decided to get them out sooner, but after careful pruning of ONLY the OLD canes was left with only short (new) canes 1-2 feet at most. So this year we have ONLY healthy-looking VERY SHORT canes that are producing well. What did I do wrong?" "Hi Penny. I have to confess that I'm not sure why your canes will have grown to be so short, but if they are producing well then hopefully this isn't too much of a problem. One thing to make sure of is to feed the base of the canes in late winter by adding a thick mulch of well-rotted organic matter. This will help feed the roots and encourage good growth." "I live in the sunny Okanagan in BC Canada. I have 2 blackberry bushes in separate pots that I planted this past late spring. Both are producing fruit as well as lots of suckers. Can I cut the suckers now and try to root them so I have more plants and if not now while I still have berries coming, when and how do I make new plants and from which suckers if I do? Also, when and how do I prune since they are in pots? I might take out of pots and grow against my chain link fence for next year! Thank you very much!" "I need help...I have really large thornless blackberry vines. The branches with five leaves never seem to get berries, the branches with three leaves set the berries, should I cut the canes off to the ground if they have five leaves. Please help. The five leaf canes are taking over and never have berries. " "Hi Kimberlee. You can grow blackberries from suckers. Carefully dig around the sucker to extract as much of the roots as possible, then replant elsewhere. Pruning is simple - just cut all the stems that have fruited back down to the ground in autumn/fall. New shoots can then be tied in during the winter, ready for fruiting next summer." "Hi Rita. I have to confess that this is a mystery to me. It almost sounds like you have two separate plants growing entwined, together. Blackberry canes that have fruited should be cut back in the autumn/fall. The new canes can then be tied in. If the leaves of the five-leaf canes look completely different to the three-leaf canes, then I'd be tempted to remove them completely. But you'd need to be certain they are definitely not from the same plant." "How many cane are left per square foot"
"Will raspberry canes with 5 leaves fruit? Ive taken over an allotment and notice the ones with 3 leaves have fruited this year, but cant find any on the 5 leaves canes, should I cut them out?" "Hi Mark. Please see my reply to Rita a few posts up in this thread. I hope this helps." "Hi Roger. There's no exact number of canes that should be left. As long as all the old, fruited canes are cut out, you should be left with healthy, new cane that will fruit next." "Thanks Ben, These are from the same plant, these are all raspberry plants, the ones with 5 leaves don't fruit, should I cut them out? " "Hi experts, I am at a cottage north of Winnipeg manitoba. My raspberry bush has expanded to good size and manageable. Looks healthy. I do not know if this is summer with second crop or the autumn variety. I leave here in Oct and return in late May do I am not around to prune when the plants go into hibernation in the winter. Problem I have now, about 70% of the canes are just now bearing fruit with most of it inmature on the 6 of Oct. We are leaving in a week. Do I cut all the canes down or do wait and prune when I return in mid may. I did that this year so I think I printed too late and hence my late crop." "My raspberry are fruiting too late in the fall. They start in september and most of the time freeze before they are finished fruiting. " "Thanks Lina, hopefully someone can help. I am very seriously planning to prune all the canes back to 6 inches even though the small Raspberries are developing but not yet red and the leaves are still healthy and green with the hopes that an early in the fall haircut will start them earlier in the spring before I arrive at the cottage in mid May. Any thoughts? " "Hi Jock. That's a big of a dilemma you have there. On the one hand if you prune too early you may weaken the plant and compromise its ability to send out strong new shoots next year. On the other hand if you leave it too late the old growth will get tangled up with the new growth and it may prove difficult to tell them apart and give the new shoots less light and air as they start into growth. Given your location, I'd be tempted, however - give a choice of the two - to wait until mid May, as I imagine spring is much later where you are then where I am in the UK. Make it your very first job when you get to your cottage. It should be reasonably straightforward to tell this year's new growth (pale green, shorter shoots) from the older, tougher stems. I think pruning is May would be safest for the plant. If, however, you get another really late crop, you could try pruning in October next year and then see how that goes." "I live in northern Alberta, so the growing season is short. Still, I get a pretty good yield from a very small patch of raspberries. They've been there for 20 years - no idea what type they are. Here's the problem - they grow about 8 feet tall, which would be fine if they stayed upright. They droop over the lawn, fall onto each other and generally create a huge mess that makes it really hard to pick the berries. The new growth is just as tall. Should I prune them now, so they will be shorter fruit bearing plants next year? " "Hi Ellen. This is a tricky one if you're not sure which type of Raspberry you have. If they are that tall, and that unwieldy then it may be best to wait until the winter before cutting them all down to the ground. The new shoots will then have the space to grow out and produce next year's crop. But it does sound like the canes are very old, and it may be best starting afresh. You can then plant them against a post and wire support system, tie in the shoots and be much better placed to pick and prune them in future." "hi there I have a small patch of raspberries .. dont know the kind.. they are beginning to fruit in September the canes are so high (about 6 feet) I have had to support them with a post and tie them or kind of wind them around so they dont fall over ..... I didn't know I should be cutting them down... How far down should I cut them ?? and when??? like about a foot from the ground and after they are done fruiting ... I have been breaking off the canes that are dead in the spring as a few canes appear to die every year .... but I have left the long ones alone .... thanks in advance "
"It seems like you have autumn-fruiting raspberries, in which case the canes should be cut back in winter. You can cut them right down to ground level, leaving just an inch or so of stump. The canes will grow up from the surrounding ground, so these old canes are in effect useless at this point."